One of the big steps (or even jumps) a lot of people in the Oracle community would like to see is the release of SOA Suite 11g. In the mean time we would be very glad if a smaller step was taken: the release of SOA Suite 10.1.3.5. This release could actually be a larger step than can be derived from the version number. Why? 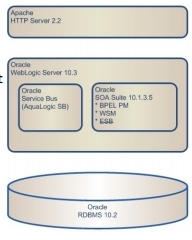 In the light of the strategic directions that Oracle has projected, we would like to use WebLogic and the Oracle Service Bus (the former ALSB) besides Oracle BPEL. Preferably the latest and greatest 😉 Currently the lastest supported Oracle/BEA WebLogic version for SOA Suite (10.1.3.4) is 9.2, according to Metalink. SOA Suite 10.1.3.5 will enable us (according to Metalink) to run both the latest version of SOA Suite and the latest WebLogic server (10.3). Certified that is. The release of Fusion Middleware 11g preceded the release of SOA Suite 10.1.3.5. From now on the challenge as described above can be faced by using 11g. This entry was posted in Oracle, Release, SOA Suite and tagged Release, SOA Suite on 2009/04/01 by PeterPaul.